Instant Pot or Ninja Foodi French Onion Beef Brisket is one of the easiest ways to get that tender and juicy beef brisket you are wanting. The French onion adds so much flavor to the brisket, and creates a sauce to spoon over your brisket. 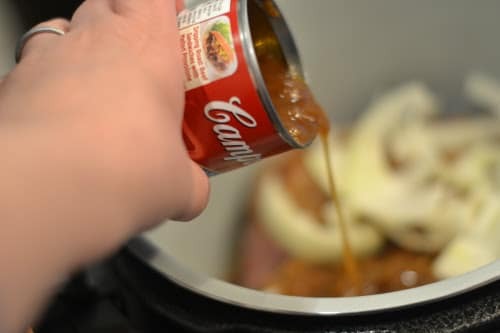 This Instant Pot or Ninja Foodi French Onion Beef Brisket is so easy to prepare, it is a perfect dump and go recipe. Great for holidays or a weekend dinner for the family. My grandmother would always serve it for Passover. I like to serve it often for Christmas or Easter. I love making French Onion Beef Brisket any time of the year. If you are scared to cook a brisket, using your Ninja Foodi or Instant Pot is the way to go! It locks in the moisture to give you one incredible brisket. Brisket is a cut of meat that can’t be rushed. It is very fibrous and tough, so a low and slow cooking is a must. With pressure cooking it helps speed up the cook time drastically. You cook under such pressure it helps break down the brisket a lot faster. The natural release is where you will find it tenderizes the meat even more. So you end up with a flavorful, tender brisket! Cutting brisket is easy and if you learn the right way it will help maximize the tenderness of your meat. 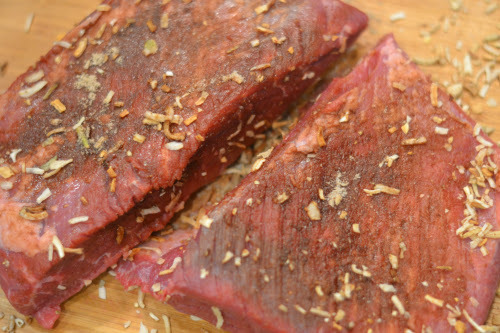 Cutting against the grain helps to cut through the fibers and leaves you with tender meat. If you don’t cut the proper way you will end up with a very tough and chewy brisket. This is one slab of meat that does have a specific way to cut for maximum results. Grab any of your favorite sides to pair next to this incredible meat! Serve as a holiday main dish or just a regular weeknight dinner with your favorite sides. It’s such a versatile meat! Here are a few of our favorite sides! Truly you can make any side to go along. Wel like potatoes cause you can spoon the sauce on top for salty and savory flavors. More than likely you will have leftovers if you don’t feed a crowd! Store any leftovers in the fridge for up to three days. After that you will want to toss any leftovers you may have. A tender brisket will taste like roast beef in a sense. Then you will take on other flavors you use when you cook it. In this case, you have a savory and tangy French Onion flavor that is throughout! If you are not used to cooking brisket, I think you will really enjoy it if you are a fan of beef! This recipe here is so simple to make and doesn’t require a ton of ingredients or steps! Grab your Ninja Foodi or Instant Pot and give my French Onion Brisket recipe a try today. I think you will really enjoy the flavor and tenderness of the meat. Have you made French Onion Brisket before? Season the brisket all over with the dry onion soup mix. Turn to "saute". Add the butter and allow it to get hot. Add the brisket to the pot and sear both sides for about 4-5 minutes or until it is starting to brown. Add the broth and french onion soup. Scrape away any bits to deglaze the pan before closing the lid. Press Pressure (it should automatically set to HIGH pressure). Set time to 65 minutes. Hit START. Once done, do a natural release for 15 minutes and than you can finish releasing the pressure. Open the lid. Cut meat against the grain. Serve with the liquid in your pot.